هدف از پژوهش حاضر بررسی کیفی نقش بازتاب فراشناختی در حل مسئله ریاضی دانشجویان مهندسی است. جامعۀ آماری تحقیق شامل دانشجویان مهندسی عمران، مکانیک و الکترونیک است که در سال تحصیلی 94-1393 در دانشگاه شهید باهنر کرمان مشغول به تحصیل بودند و تعداد 12 نفر از آنان با استفاده از نمونه­گیری هدفمند برای انجام مصاحبه انتخاب شدند. در این مقاله بازتاب فراشناختی بر روی حل مسئله دانشجویان مهندسی در دو مقولۀ دانش و نظارت فراشناختی مورد­بررسی قرار گرفته است. نتایج این تحقیق نشان داد که «بازتاب»می­تواندتواناییحلمسئلهریاضیدانشجویانمهندسیراافزایشدادهوتواناییکنترلوارزیابیدرستیدرشرایطحلمسئلهبهآنهابدهد.این پژوهش نشان می­دهد حل مسئله امروزه چیزی فراتر از راه­حلهای جزئی و به­کاربردن آنها برای حل مسائل در دسترس است بلکه می­تواند راهی برای تشویق دانشجویان مهندسی باشد تا با علم مهندسی به حل مسائل دنیای واقعی بپردازند؛ زیرا حل مسائل دنیای واقعی فراگیران را به استدلال و قضاوت در سطوح بالاتر و همچنین یافتن ایده­های جدید وامی­دارد. 1PhD Student, Faculty Math. & Computer, Department Applied Mathematics, Shahid Bahonar University of Kerman, Kerman, Iran. 2Associate Professor, Faculty Math. & Computer, Department Applied Mathematics, Shahid Bahonar University of Kerman, Kerman, Iran. Aim of the present research is to investigate the role of metacognitive reflection in solving mathematic problems of engineering students. Samples of this research (12 students) are selected for interview among the students of civil engineering, mechanic, and electronics who were educating in Bahonar Kerman University in 2014-2015 using targeted sampling. In this paper examined metacognitive reflection on problem solving of engineering students has been examined from two aspects of knowledge and metacognition monitoring. The results of the research showed that “reflection” could increase the problem solving capability of the engineering students and could make them able to control and evaluate correctly in problem solving conditions. This research shows that problem solving is something more than finding small solutions for today`s problems and applying them to solve available problems also; it can encourage engineering students to use their engineering knowledge to solve real world problems. This is because solving the real problems makes learners justify to judge the problems in higher levels and also find new ideas. حکیم­زاده، رضوان؛ طرخان، رضاعلی و محمدی فارسانی، فریبرز (1394). بررسی ادراکات دانشجویان فنی ـ مهندسی از کیفیت تدریس و تأثیر آن بر انتخاب رویکرد یادگیری (مطالعه موردی: دانشگاه تهران). تهران، فصلنامه آموزش مهندسی ایران، 17(68)، 14-1. صمصام­شریعت، سیدمحمدرضا و رنجبر­کهن، زهره (1392). تحلیلی بر فراشناخت: بررسی دیدگاه­ها و پژوهش­ها. چشم­انداز امین در روان­شناسی کاربردی، 1(1)، 24-1. عطارخامه، فاطمه و سیف، علی­اکبر (1388). تأثیر آموزش راهبردهای یادگیری مطالعه فراشناختی بر انگیزش و پیشرفت تحصیلی دانش آموزان. تهران، پژوهش نامه مطالعات روان شناسی تربیتی، 6(9)، 74 ـ 57. کریمی، فرهاد؛ مرادی، علیرضا؛ کدیور، پروین و کرمی نوری، رضا (1391). تحلیل عاملی آزمون فراشناختی حل مسئله­های کلامی ریاضی. مجله علوم روانشناختی، 11(44)، 539 ـ 517. مارشال، کرتین و گرچن، راسمن (1377). روش تحقیق کیفی. ترجمه علی پارساییان و سیدمحمد اعرابی، تهران: دفتر پژوهش­های فرهنگی، چاپ دوم. محمدپور، احمد (1389). ضد روش: منطق و طرح در روش­شناسی کیفی. جلد اول، تهران: جامعه­شناسان. 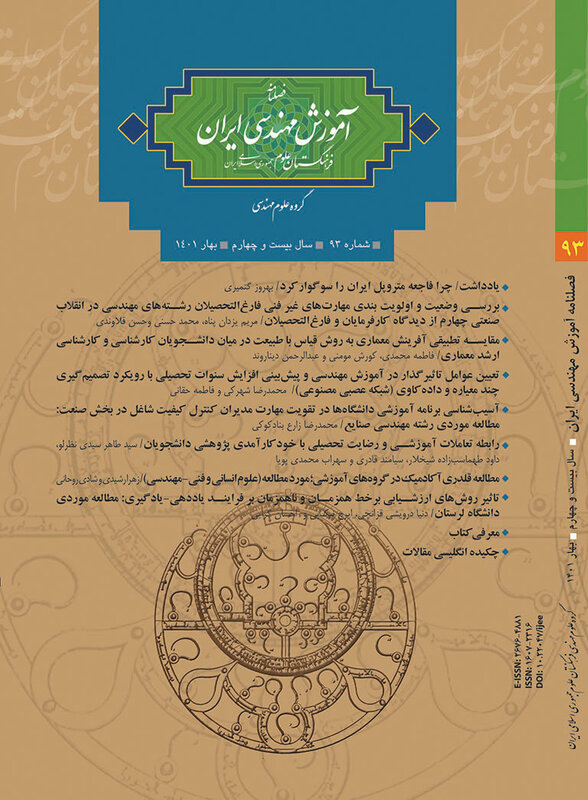 محمدزاده یزد، عاطفه (1391). بررسی کیفی شکاف نسلی ارزشی بین مادران و دختران در مشهد با تأکید بر ارزش­های دینی. نشریه جامعه شناسی کاربردی، 23(2)، 88-65. میری، زهره؛ احقر، قدسی و احمدی، امینه (1390). تأثیر مهارت­های حل مسئله بر یادگیری خودنظم­جویی دانش­آموزان. مجله مشاور مدرسه، 7(27)، 29 ـ 24. Alves, M. (2016). Self-efficacy, mathematics’ anxiety and perceived importance: an empirical study with Portuguese engineering students. European Journal of Engineering Education, 41(1), 105-121. Artzt, A. and Armour-Thomas, E. (1992). Development of a cognitive-metacognitive framework for protocol analysis of mathematical problem solving in small groups. Cognition and Instruction, 9, 137 -175. Bormotova, L. S. (2010). A qualitative study of metacognitive reflection: the beliefs, attitudes and reflective practices of developing professional educators. (PhD Dissertation), Indiana University of Pennsylvania. Borrego, M.; Douglas, E. P. and Amelink, C. T. (2009). Quantitative, qualitative, and mixed research methods in engineering education. Journal of Engineering Education, 98(1), 53-66. Chatterjee, A. (2005). Mathematics in engineering. Current Science, 88(3), 405-414. Creswell, J. W. (2013). Research design: Qualitative, quantitative, and mixed methods approaches: Sage Publications. Desoete, A.; Roeyers, H. and Buysse. A. (2001). Metacognition and mathematical problem solving in grade 3. Journal of learning Disabilities, 34(3), 435-449. Ernest, P. (2010). Add it up: Why teach mathematics?. Professional Educator, 9(2), 44-47. Flavell, J. H. (1976). Metacognitive aspects of problem solving. In L. Resnick (Ed), The nature of intelligence. Hillsdale, NJ: Laerence Erlbaum, 231-235. Flegg, J., Mallet, D. and Lupton, M. (2011). Students' perceptions of the relevance of mathematics in engineering. International Journal of Mathematical Education in Science and Technology, 1-16. Fortunato, I.; Hecht, D.; Tittle, C. K. and Alvarez, L. (1991). Metacognition and problem solving. Arthmetic Teacher, 1, 38 – 40. Gibbs, G. (1988). Learning by doing: A guide to teaching and leaching and learning methods. London: Further Education Unit. Goold, E. (2012). The role of mathematics in engineering practice and in the formation of engineers, (PhD Dissertation), Department of Design Innovation, National University of Ireland Maynooth. Goos, M., Brown, R. and Makar, K. (2008). Self-efficacy in mathematics: affective, cognitive, and conative domains of functioning. Proceedings of the 31st Annual Conference of the Mathematics Education Research Group of Australia, Victoria University of Wellington. McCutcheon. MERGA, 507–513. Hartley, K. and Bendixen, R. (2001). Educational research in the internet age: Examining the role of individual characteristic, Educational Research, 39(1), 22-26. Jagals, D, van der Walt, M. (2010). Mathematics confidence: reflection on problem solving experiences. Mathematics Education Research Journal, 22, 138-150. John, C. (2009). Becoming a reflective practitioner. United Kingdom: Blackwell. Janowski, G. M.; Lalor, M. and Moore, H. (2008­). A new look at upper-level mathematics needs in engineering courses at UAB. American Society for Engineering Education (ASEE) Annual Conference and Exposition City: Pittsburgh, PA.
Kapa, E. (2001). A metacognitive support during the process of problem solving in a computerized environment. Educational Studies in Mathematics, 47(1), 317- 336. Kaune, C. (2006). Reflection and metacognition in mathematics education – tools for the improvements of teaching quality. Analyses, 38(4), 350–360. Litzinger, T. and Firetto, C. M. (2010). A cognition study of problem solving in statics. Journal of Engineering Education, 17(2), 337- 353. Lucanglei, D. and Cornoldi, C. (1997). Mathematics and metacognition: What is the nature of the relationship? Mathematical Cognition, 121–139. McCutcheon, S. L. T. (2008). Self-efficacy in mathematics: affective, cognitive, and conative domains of functioning. Proceedings of the 31st Annual Conference of the Mathematics Education Research Group of Australasia. McNeill, N. J.; Douglas, E. P.; Koro‐Ljungberg, M.; Therriault, D. J. and Krause, I. (2016). Undergraduate students' beliefs about engineering problem solving. Journal of Engineering Education, 105(4), 560-584. Miles, M. and Huberman, M. (1994). Qualitative data analysis: An expanded sourcebook. Sage Publication, Incorporated. Phang, F. A. (2009). The patterns of physics problem solving from the view of metacognition. Unpublished M.Phil. (PhD Dissertation), University of Cambridge, Cambridge. Ridley, D. S.; Schutz, P. A.; Glanz, R. S. and Weinstein, C. E. (1996). Self-regulated learning: the interactive influence of metacognitive awareness and goal-setting. Journal of Experimental Education, 60(4), 293–306. Rolfe, G.; Freshwater, D. and Jasper, M. (2001). Critical reflection for nursing and the helping professions: A user’s guide: Palgrave, Basingstoke. Schoenfeld, A. H. (1992). Learning to think mathematically: Problem solving, metacognition, and sense-making in mathematics, In D. A. Grouws, (ed. ), Handbook for Research on Mathematics Teaching and Learning, New York, NY: Macmillan. Schraw, G.; Crippen, K. J. and Hartley, K. (2006). Promoting self-regulation in science education: Metacognition as part of a broader perspective on learning. Research in Science Education, 36, 111–139. Tock, J.L. and Moxley, J. H. (2017). A comprehensive reanalysis of the metacognitive self-regulation scale from the MSLQ. Metacognition and Learning. 12(1), 79-111. Van Der Walt, M. S. and Maree, J. G. (2007). Do mathematics learning facilitators implement metacognitive strategies? South African Journal of Education, 27(2), 223–241. Van Opstal. M. and Daubenmire. P. (2015). Extending students’ practice of metacognitive regulation skills with the science writing heuristic. International Journal of Science Education, 37(1), 1089-1112. Weil, L. G.; Stephen, M. F.; Iroise, D.; Emma, J. K.; Rimona, S. W.; Geraint, R.; Raymond, J. D.; Sarah -Jayne Blakemore (2013).The development of metacognitive ability in adolescence. Consciousness and Cognition, 22(1), 264 -271. Yimer, A. and Ellerton, N. F. (2010). Cognitive and metacognitive aspects of mathematical problem solving: An emerging model. MERGA, 1–8.